I probably should have written this two weeks ago but I wanted to finish my Munger trilogy. I dislike when hindsight bias is used and prefer when people tell me when they are going to do something or just did and the reasons for it so that the decision can be evaluated objectively. Although this isn’t quite the case, I’m telling you what I did fairly close to when I took the action all things considered. 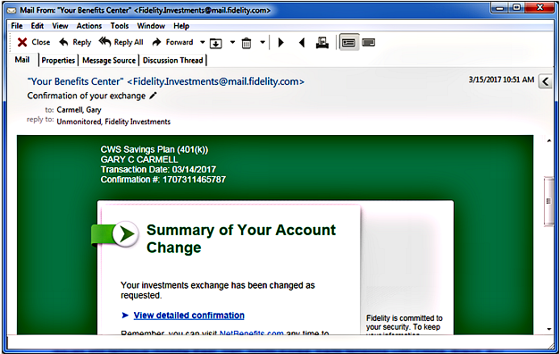 The day before the Fed raised short-term rates (March 14th) I moved a large percentage of my 401k funds from stocks into fixed income. I want to be clear that it’s distinctly possible that I could have made the wrong decision and will underperform the returns that would have been generated had I done nothing. I don’t make many moves in the account and I’m really not a big believer that one can effectively time the market since you have to make two good decisions. Not only do you have to get out to avoid the downturn but then you have to get back in so you don’t miss the inevitable recovery. I did avoid much of the 2007-8 carnage by having gone to cash in 2007, although I did get back in a bit early in late 2008 and had to ride the downturn to the bottom in March 2009. Back then I saw too many excesses that were at risk of being unwound with negative repercussions for the economy. 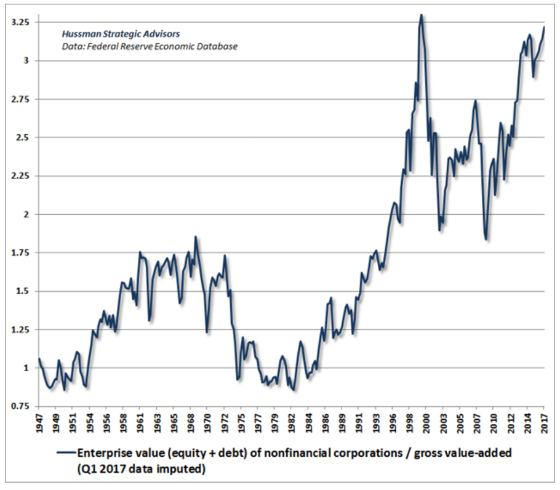 While I don’t see the same level of excess in credit markets (other than corporate debt to a lesser degree), I think there is too much optimism baked into equity prices. 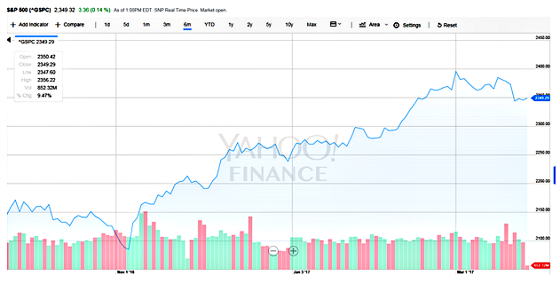 We have seen the market make some really great gains since the election as the following chart of the S&P 500 shows. The narrative is that stocks have gone up based on Trumped up expectations of tax reform, Obamacare repeal and replacement, infrastructure, and deregulation. At the same time, interest rates have been rising along with the market which has helped financial stocks that presumably will make more money in an environment with a steeper yield curve. The market has seemed to ignore any of the brewing storms on the international front and the impact that a higher dollar would have on foreign, dollar-denominated debts to the tune of $10.5 trillion. And let’s not forget about valuations and investor sentiment. The more I saw of Trump’s leadership style and the divisions in the Republican Congress the less chance I saw of his pro-growth agenda coming to fruition. 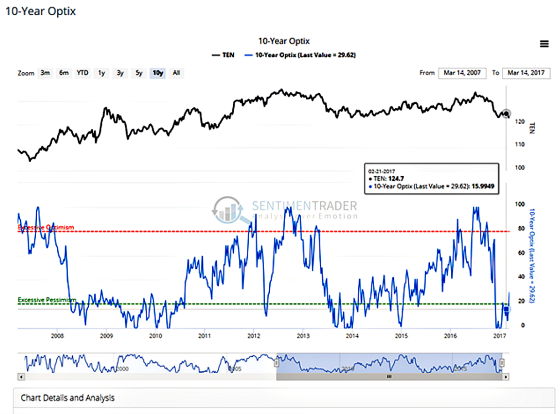 I subscribe to sentimentrader.com which I use to see where extreme positioning may be in various asset classes. I typically focus on bonds since we borrow a lot of money and real estate is heavily impacted by interest rate movements in terms of valuation, investor sentiment, and underwriting criteria for lenders. It’s also helpful to construct a bigger picture narrative to put the pieces of a puzzle together to help explain how investors are viewing the world. As part of my use of sentimentrader.com, I look carefully at how smart money hedgers are positioned versus the dumb money speculators. I have been reading over time that the smart money was short oil and stocks and long both short and long-term bonds. This was painting a picture for me that I thought the market (dumb money) was getting wrong. Investors were betting on the reflation trade and the Fed continuing to hike methodically such that banks would continue to prosper and the economy would grow to spill over to strong earnings. So what was not right about this picture? The Fed has been saying that CPI would approach its target of 2% and it has just about done so. The market seemed to take this as a sign of economic growth. What they seemed to ignore was that it was approaching the 2% level because oil went up significantly in the last year. It has now been coming down and will probably drop some more as the speculators unwind their positions. This will push CPI back down below 2% and should be supportive of bonds. The following chart shows the annual percentage change in CPI after stripping out the highest and lowest changing indices representing 8% each, or a total of 16% of the index. This attempts to get to a core inflation rate without always removing food and energy like core CPI does. Once can see that it reached a cyclical high recently and has begun to come down. Taking a step back it looks like it hovers between 1% and 3% and averages just about 2%. 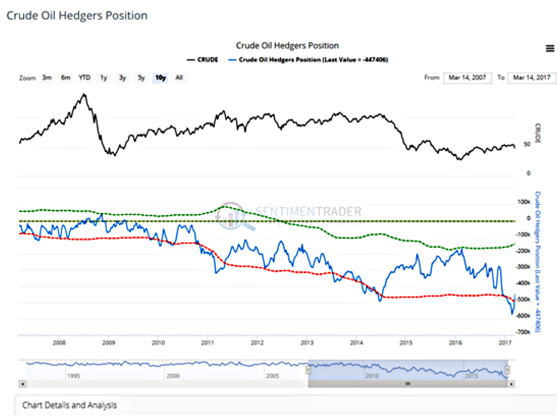 The next chart shows how hedgers are quite short oil and have been increasing their short positions as it has rallied. It’s not surprising to see that oil has pulled back and this should bring inflation down over the next six months or so. With oil positioned to roll over, and having now begun to do so, and CPI poised to follow suit, it would seem like bond yields, which had moved up sharply in a short period of time after Trump’s victory, could be a crowded trade for those betting on higher rates. 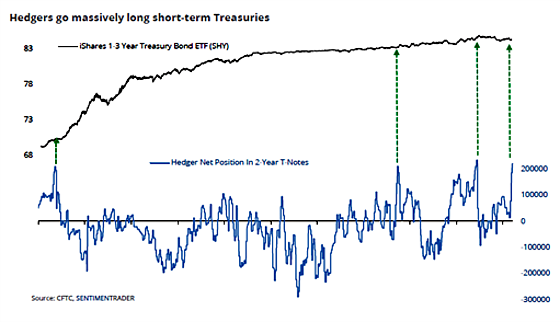 It turns out that the smart money hedgers have been quite long in terms of both short and long-term Treasuries. Like the 2-year notes, 10-year Treasury note hedgers are very long and speculators are short which creates the conditions for a rally and corresponding lower yields. The following chart is an indication of sentiment for 10-year Treasuries and it shows that there is too much pessimism and is it at levels where Treasury yields often come down in the ensuing months. 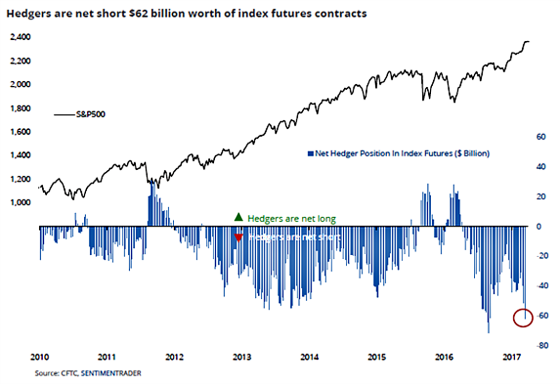 Smart money commercial hedgers have gone net short $62 billion worth of equity index futures, 2nd-largest ever; Hedgers are also now net long 2-year Treasury notes to one of the largest degrees ever, usually good for the SHY fund. The following chart shows how short commercial hedgers have gone in terms of stock index futures. It should be noted, however, that they are almost always short since they are hedging. It’s particularly notable when they go long and when they go very short like they have been recently. Finally, valuation should not be ignored. 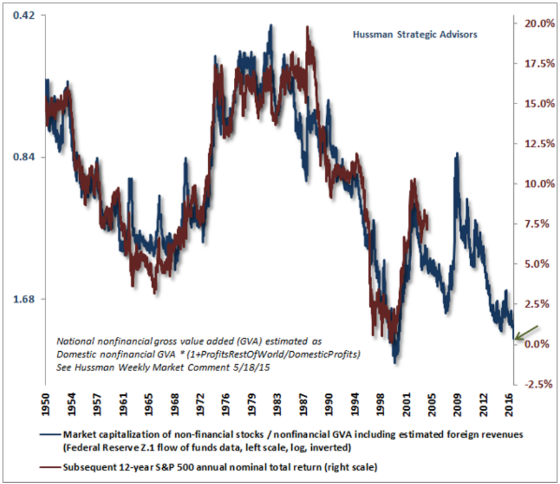 I recently referenced some of John Hussman’s charts showing how richly valued the market is and here is a couple of them updated. This chart shows prospective 12-year annual returns and one can see that they are at very low levels as a result of high valuations and Hussman’s belief that profit margins will not be as elevated in the years ahead. The risk-reward ratio is heavily skewed to far more risk than reward if his methodology is anywhere near accurate. So when I put it all together I think the market has been riding a false premise of faster growth, higher inflation, and a steepening yield curve that will help the financial sector become more profitable. I personally see Trump not catalyzing growth like the market had hoped, international issues still tenuous (Middle East, Iran, North Korea, trade tensions with China, Brexit, EU issues, nationalism, etc. ), economic nationalism running the risk of hurting global trade and capital flows, big issues for China if the dollar gets too strong in the event growth does accelerate, and the irreversible trends of the aging of the developed world as well as China, and automation, robotics, digitization, and artificial intelligence putting millions of jobs at risk which will widen the divide between the educated and those who have a high school education or less and the worker insecurity this will engender. This to me is a powerful disinflationary trend that should keep a lid on interest rates and make it difficult for growth to accelerate much beyond the new normal of 2%. And for those of you who don’t trust that I’m telling you the truth, here is a screenshot of an email confirming that I made the move on March 14th. It doesn’t show the detail, but believe me that I definitely lightened my exposure to equities. Who knows if I will have made the right move but I’m comfortable in having done so and the reasons for making the decision I did. Now you understand why ‘I Don’t Buy It So I’m Selling It’? 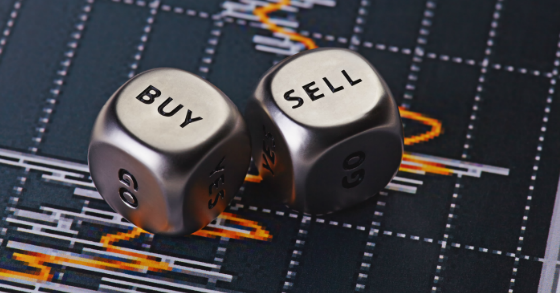 Do you feel there is too much optimism baked into equity prices? Are the markets riding a false premise of faster growth, higher inflation, and a steepening yield? Great insights, Gary. I appreciate you sharing the intimate details and background. I, too, agree with your move into fixed income and have been on a similar path of pattern recognition in the equity markets. Riding the wave up to this point may have been enough for many to watch from the equity sidelines for a while, and to understand more of the overall environment we are headed in. Certainly, this cycle is becoming an interesting one to learn in, especially with technology striving to make major innovative leaps. Thank you Carl for your comment as well as your continued support. We shall see how it unfolds. And yes, it shall be interesting whatever happens.